Here we are again the last day of the month and time for the September edition of The 12 Kits of Occasions! Jeanne is our hostess this month and talk about amazing, spooky papers and embellishments and die cuts perfect to create at least a hundred Halloween cards or more! So many fun products that I certainly don't have or never seen before. So much fun to play with. Let's get on with why you are here there is bound to be lots of exciting things to look at on the hop today. 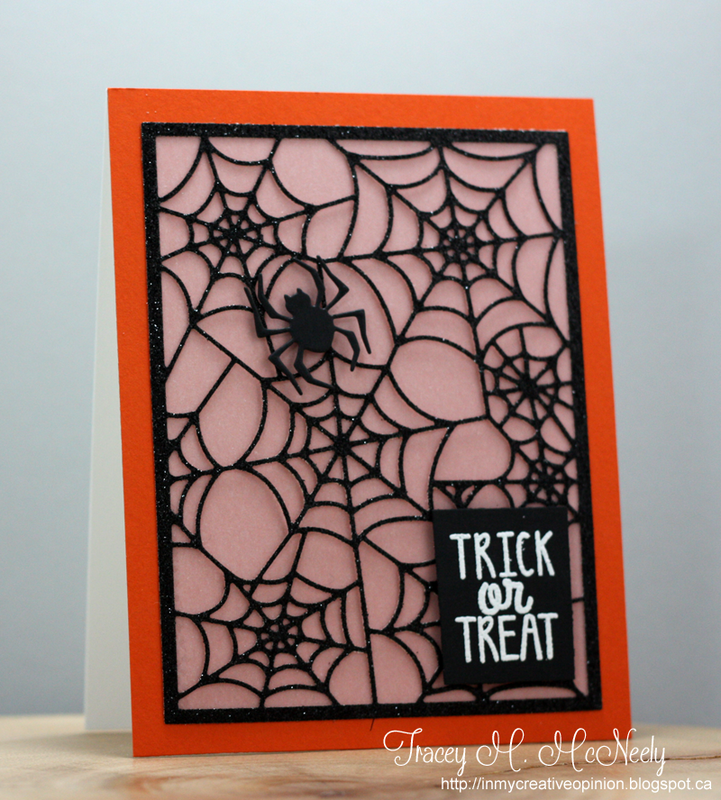 This first one was my favourite, I loved the black glittery web die cut and when I backed it with some vellum it took on a magnificent glow, wish the camera wanted to share it with you. Once I finished this last card it felt like Thanksgiving not Halloween and since the Canadian Thanksgiving is next weekend--done! It is also for Freshly Made Sketches #256. 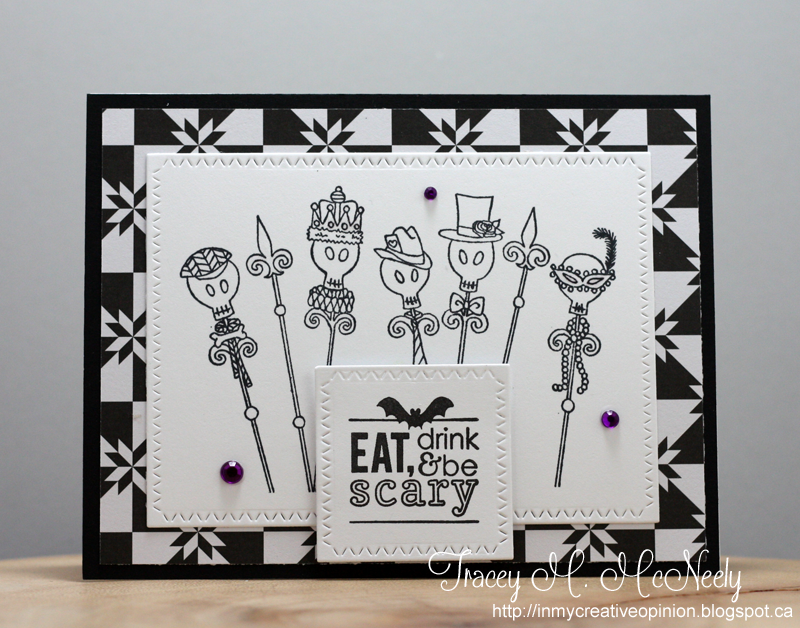 The first five cards are also being submitted to this week's Simon Says Stamp Wednesday Challenge - Anything Goes! I haven't done this in a long time but here is the lineup, still haven't found the perfect spot with the perfect lighting yet. Time for another new Mix It Up challenge at SugarPea Designs! You have all month to play along with us! You are welcome to play along with all the challenges or just one but remember the more times you play along during the month, the better chance you have of winning a $50 gift certificate to the SugarPea store!!! Today I used both the photo inspiration and the sketch. From the photo I picked the colours--green and blue from the cats unique eyes, an yellow/orange from his nose and brown from the couple patches on his fur. I turned the sketch a quarter turn counter clockwise. 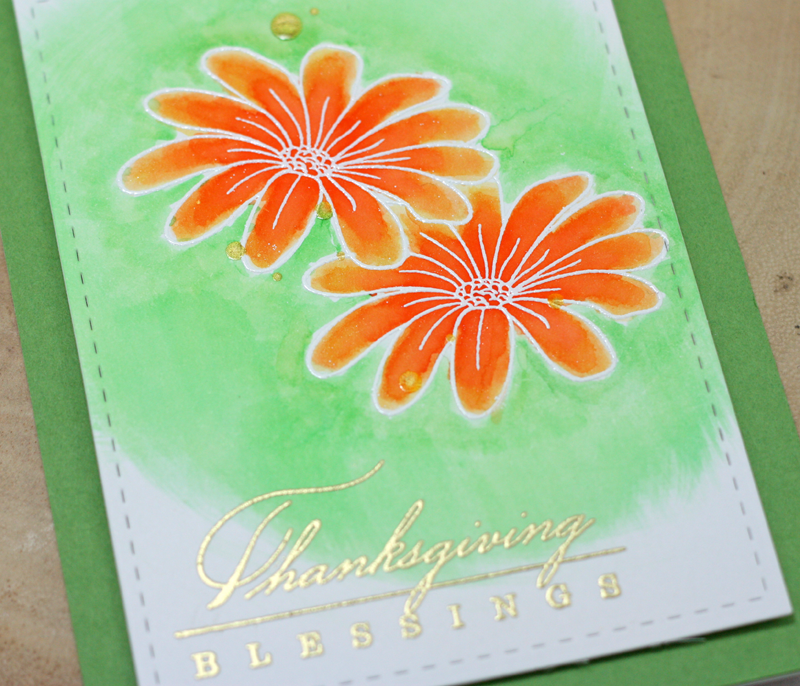 Then I stamped my own patterned paper using nature images from Lovely Leaves for the strip down the left side. 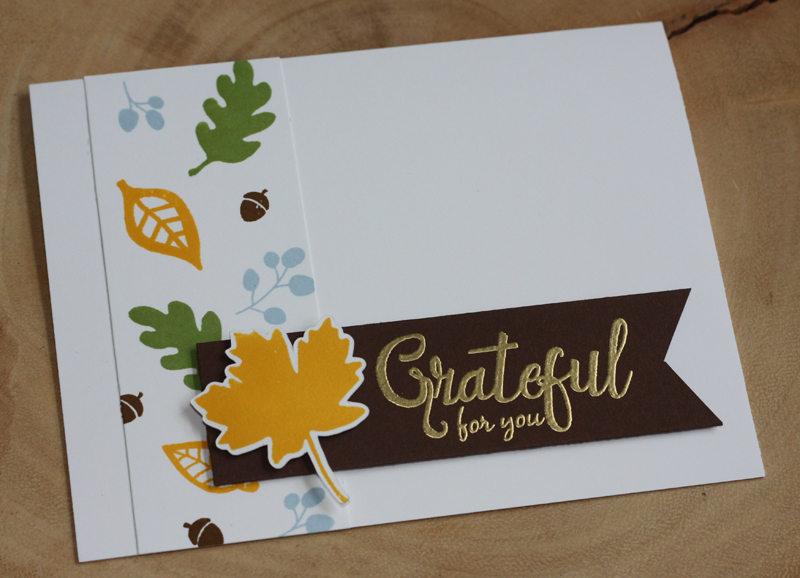 I stamped and embossed the sentiment in gold on brown cardstock and then I stamped and die cut the large maple leaf in yellow orange. The sentiment strip and the maple leaf were added with adhesive foam tape. 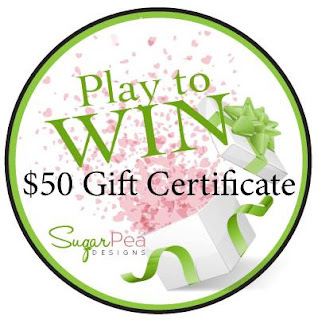 Hope to see you play along at SugarPea Designs HERE! 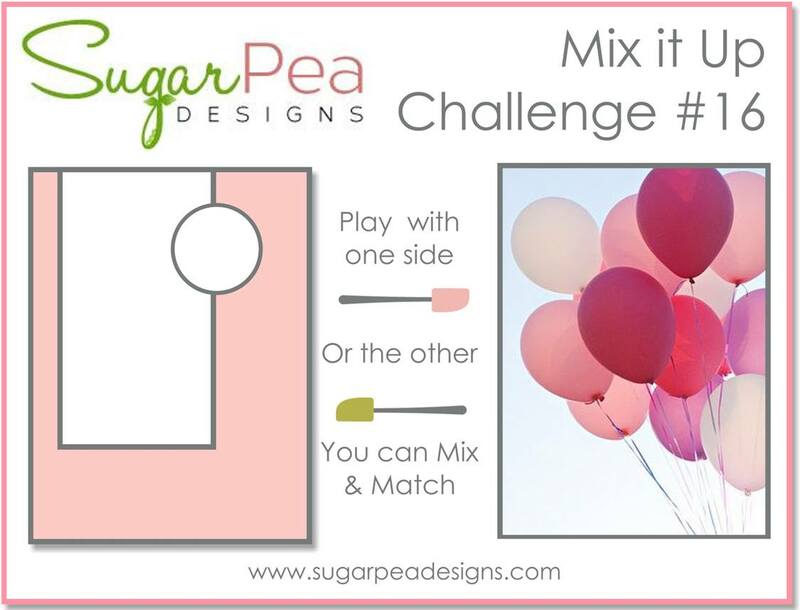 You have until September 30th to play along with any of this months challenges! 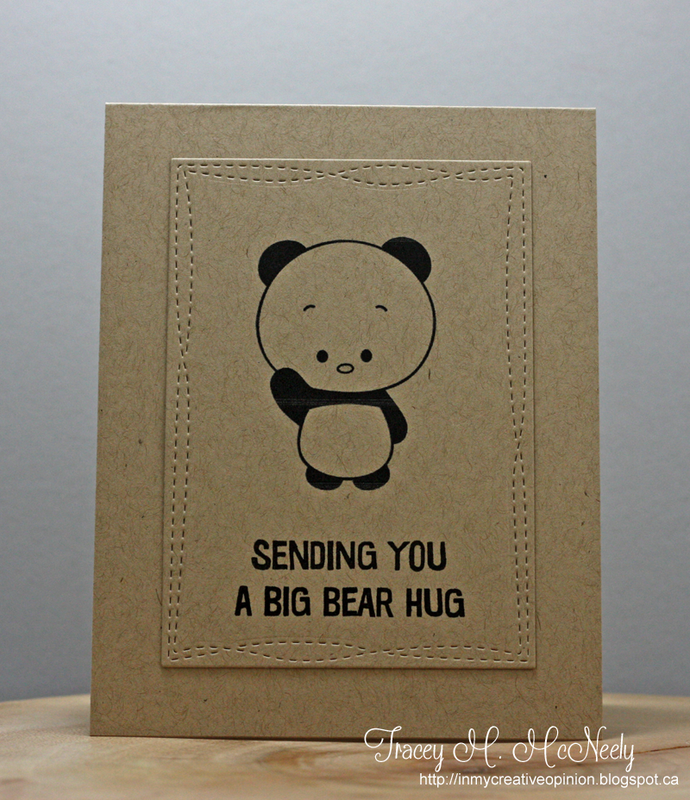 Our sponsor this week is Kitty Bee Designs and I used a cute panda image from the shop for my card today. 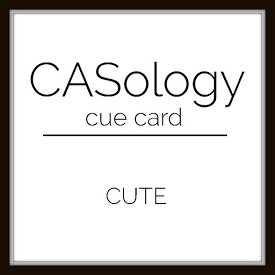 Keeping your colours minimal has great impact in CAS design. 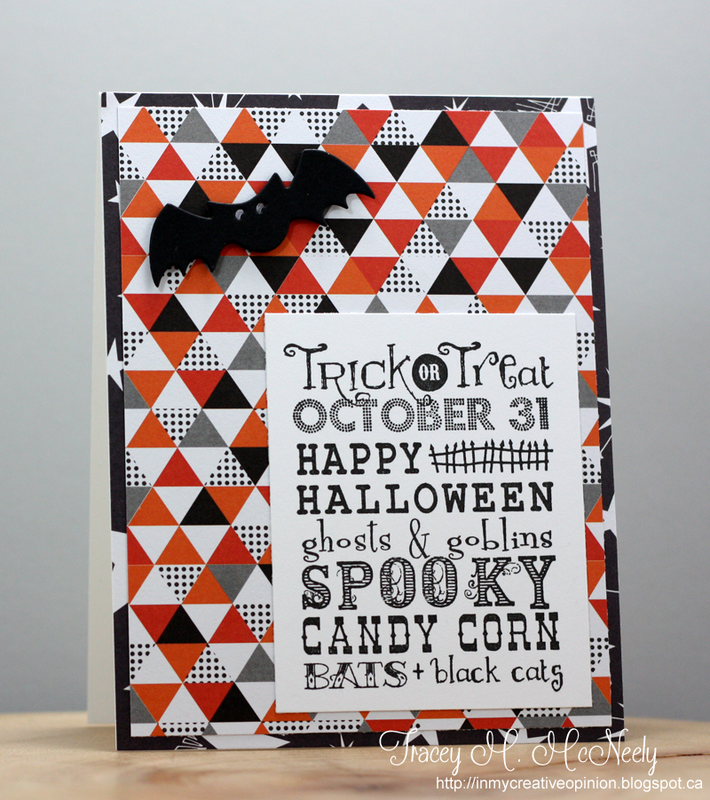 I chose to just go with kraft and black for my card. 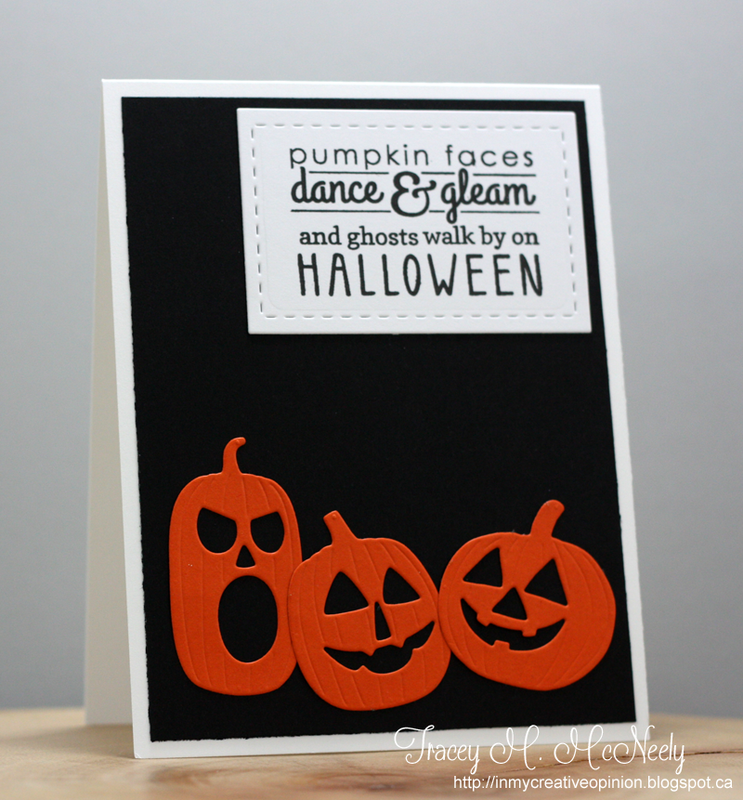 I jazzed it up with a Wonky Rectangle from MFT Stamps. This is the second of three posts this morning. 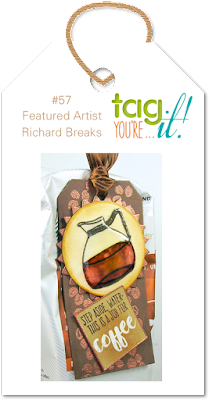 If you are looking for my first post with Birch Press click HERE. 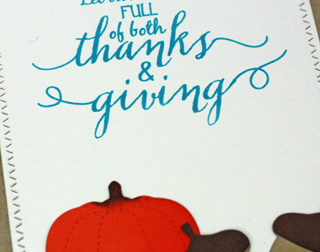 Another Thanksgiving card, as usual the Canadian Thanksgiving sneaks up on us every year. You still think that it is summer and then there it is. 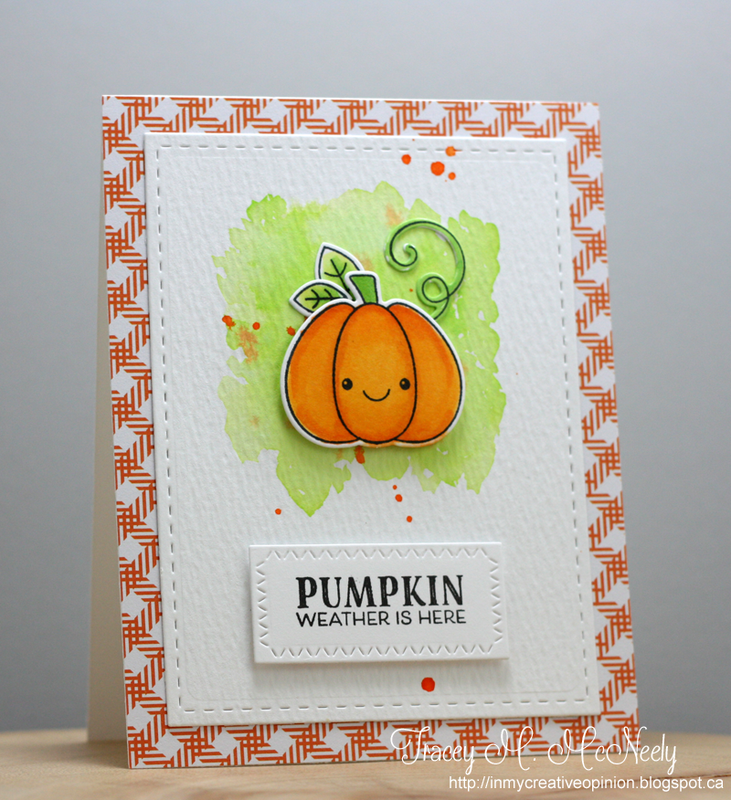 I used some products from SugarPea Design for my card today--Lovely Leaves and the Stitched Autumn Icons SugarCut dies. Head over to the colourQ to see what the rest of the team has created for this week! 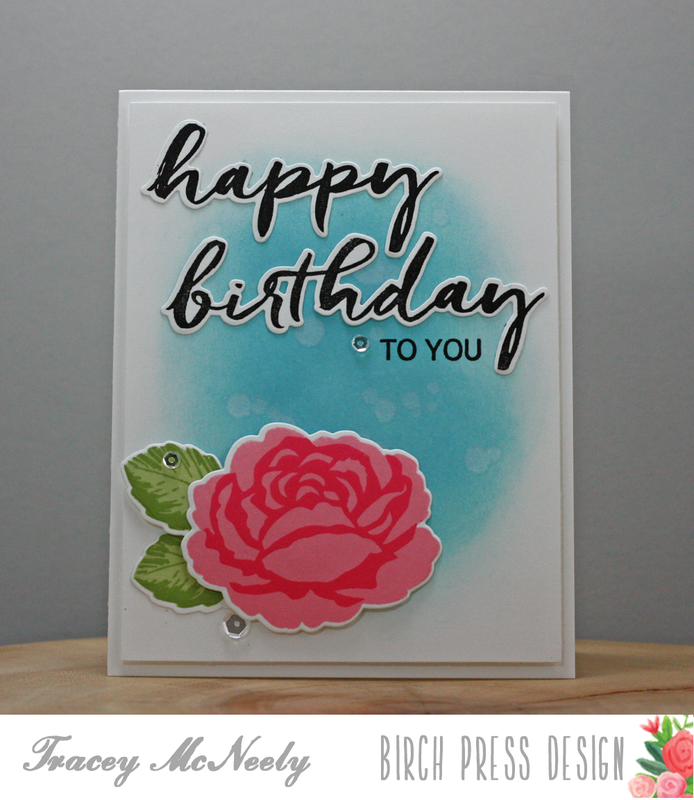 Another look at a new stamp and die set from the Birch Press Design store. 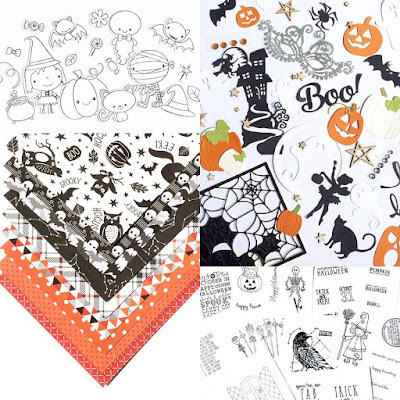 There are so many stamps and dies that are perfect for holiday crafting but also for everyday crafting. 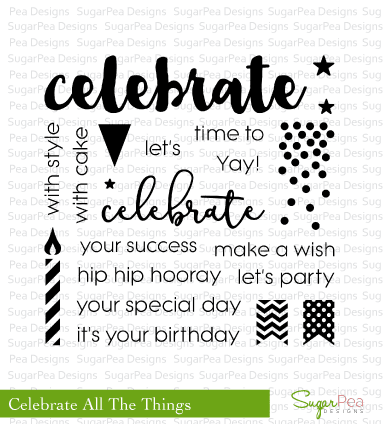 The Brushed Birthday Greetings stamp set is one set that can be used all year round and perfect that there is a set of co-ordinating dies also available. 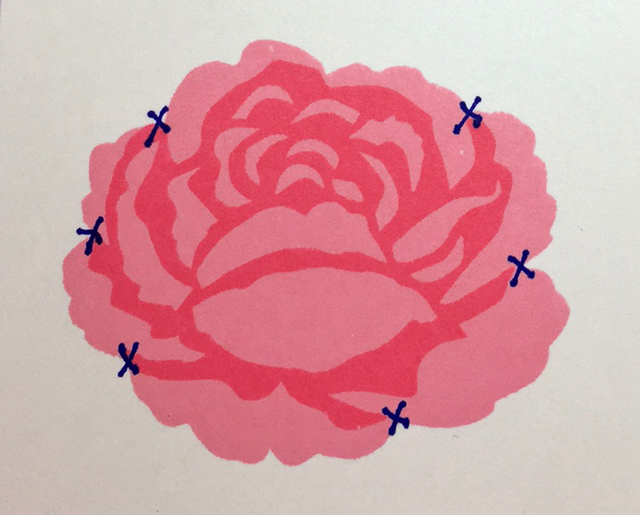 The large rose image is a 2-step image that gives the bloom depth and dimension. 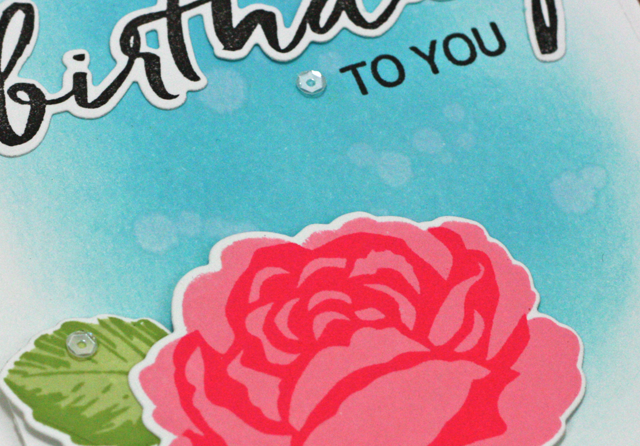 To recreate this card the first thing you will need to do is orient yourself with the two layers and how to position the top detail layer correctly. 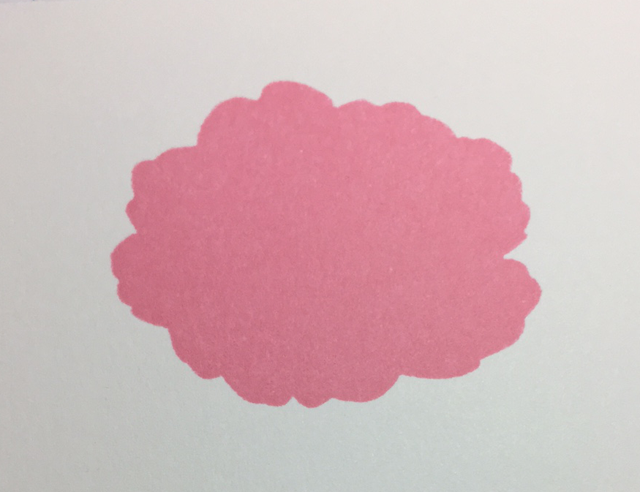 Start by choosing two ink colors and stamp the base flower in the lighter of the two shades as seen in the image below. 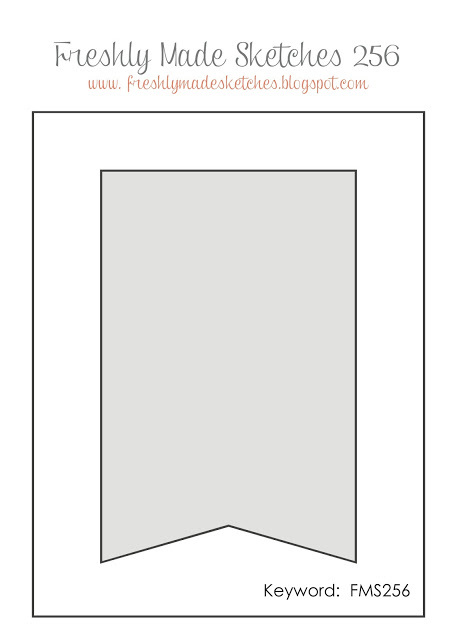 The following image shows the five points you will want to line up to add the detail layer in the darker of the two inks. Once you line the stamp up you will get a perfect placement each time. 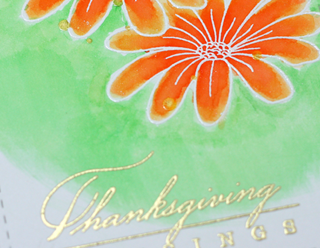 The layered leaves are easy to line up as the base images and the detail layer are basically the same shape. Line the detail layer up at the top of the stem where it meets the leaf. Next stamp and die cut the 'Happy' and 'Birthday' sentiments. All the dies are open window dies which makes die cutting easy as you just place the dies over the images. 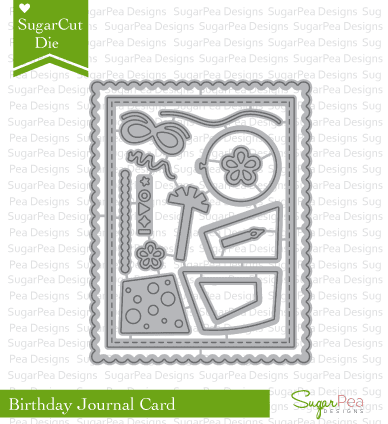 Secure the dies with some low tac tape and run it through your die cutting machine. The background panel was watercolored on watercolor paper with Distress Ink. 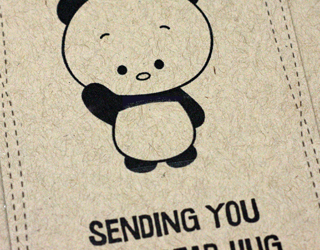 Adhere the sentiments to the panel and then stamp the 'TO YOU' directly onto the panel nestled into the sentiment. The flower is adhered with double sided adhesive foam tape. Add some adhesive to the backs of the leaves and tuck them in behind the flowers. 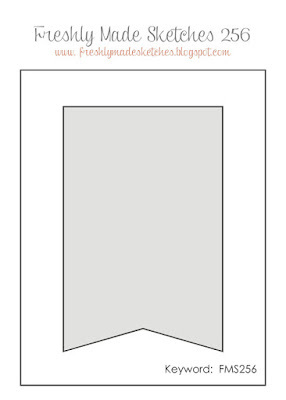 The completed watercolor panel was adhered to the card base with more double sided adhesive foam tape for added dimension. Finish the scene off by adding a few carefully placed clear sequins. 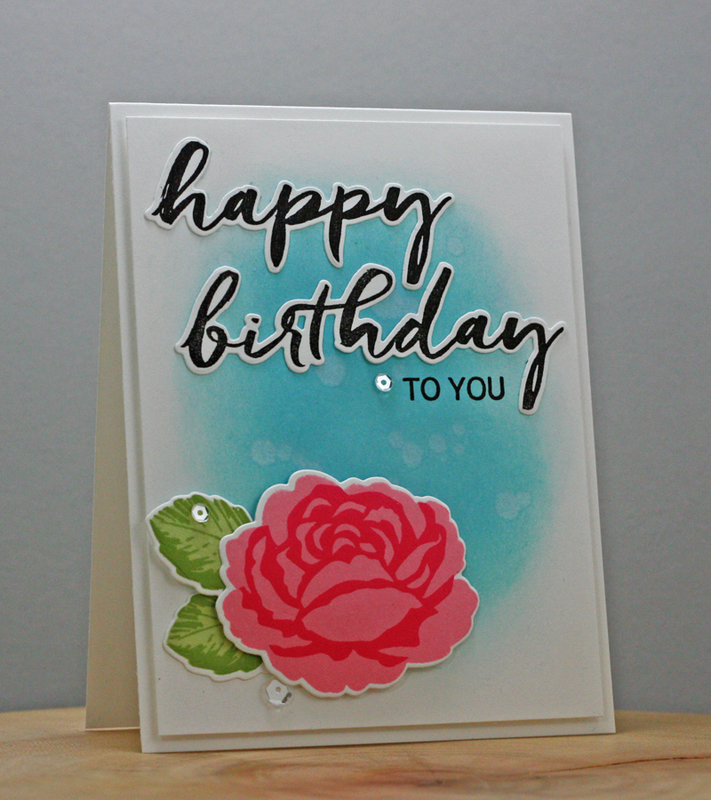 It is easy to create a beautiful card with just this one stamp and die set. Thanks for joining us again this week! 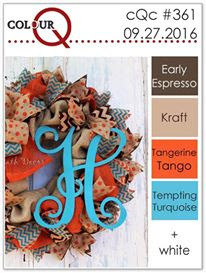 We hope to see you again next Tuesday for more crafting inspiration! 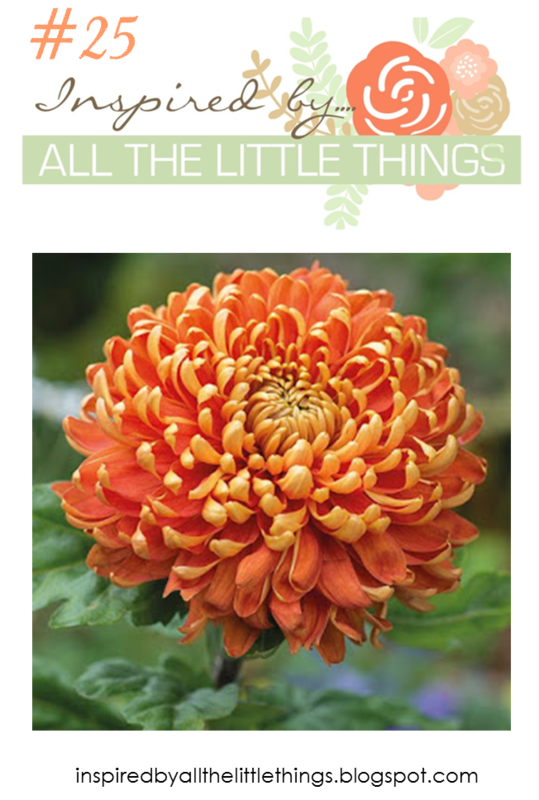 Today I have a card to share with you that I created for this week's Inspired by All the Little Things. I am the hostess this week and as soon as I saw this photo on Pinterest I knew it would be perfect for this challenge. The garden centres are full of chrysanthemums in all the gorgeous shades of autumn. 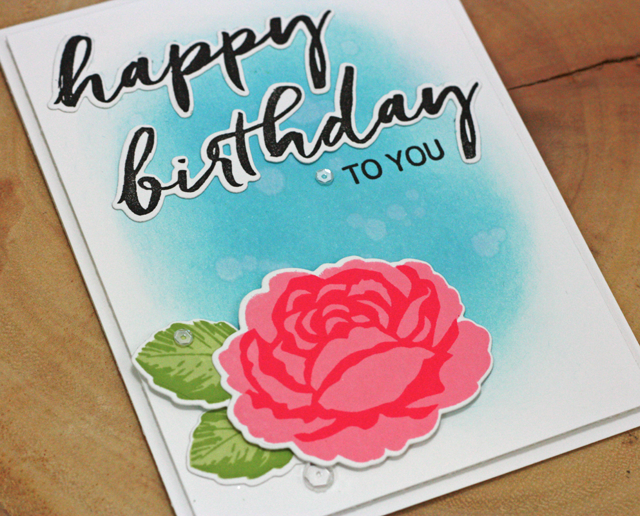 Using the photo as inspiration I created a card with these lovely images from Whimsy Stamps Mom's Layered Flowers along with a little help from my ZIG's and both white and gold embossing. I finished it off by painting the flowers with a Spectrum Noir Crystal Clear Sparkle pen and finally I splattered some gold Color Shine. Head over to the Inspired By All the Little Things blog to see who I invited this week to be my guest! Did fall arrive yet where you are? The leaves were slow to start changing this year but each day there is more and more colour! I love the warmth of summer but I equally love the warmth of putting on a sweater in the fall! Thursday I headed up to Sudbury with my parents to visit the kids armed with some home cooking for their freezers, a quick health check and to take them out for lunch. It was my parents first time to Sudbury to see where their grandchildren were going to University and to have a look at campus life. The only downside was that it poured with rain all day! 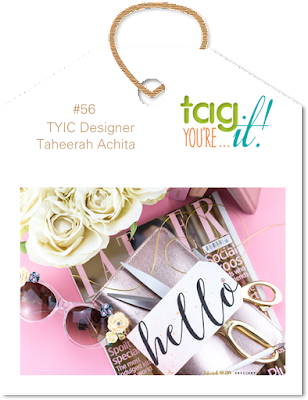 There is still time to play along at Tag You're It #56! 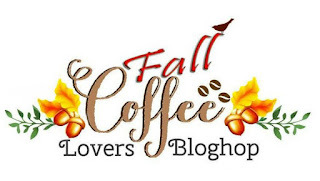 it is also the first day of the Fall Coffee Lovers Blog Hop! 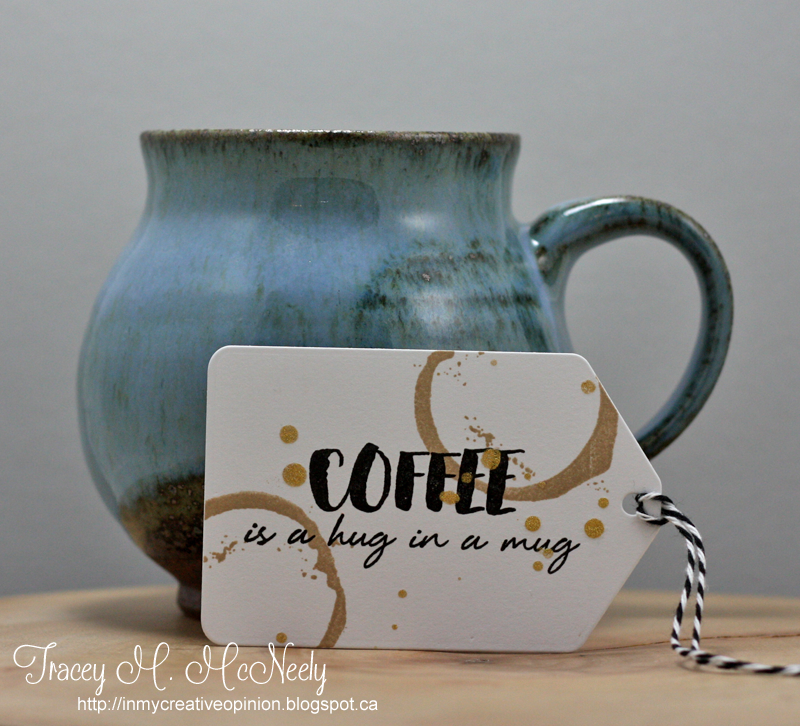 Inspired by Taheerah's simple sentiment and gold ink splatters I created a tag with the Fall Coffee Lovers Blog Hop in mind. 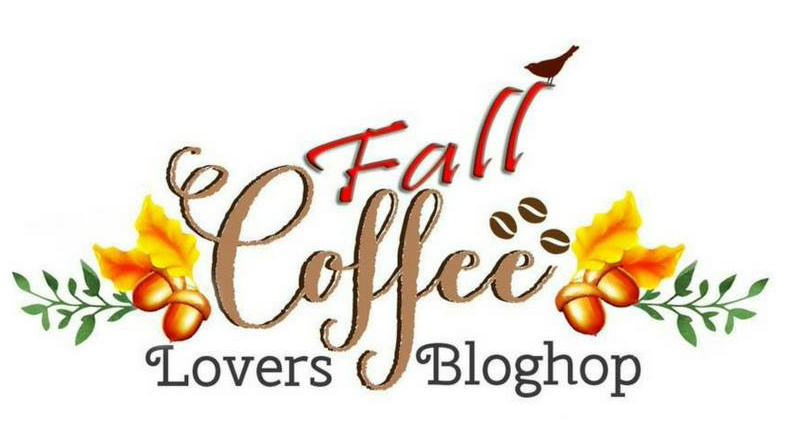 Fall says goodbye to the iced caps and frappuccinos of the summer and only leaves room for a warm cuppa and colours like coffee and black. 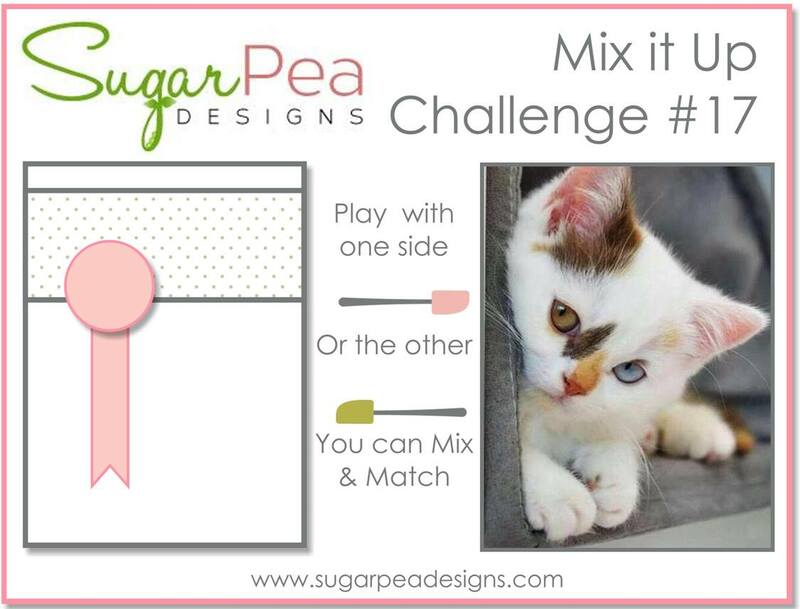 For Challenge #16 I used both the sketch and the inspiration. 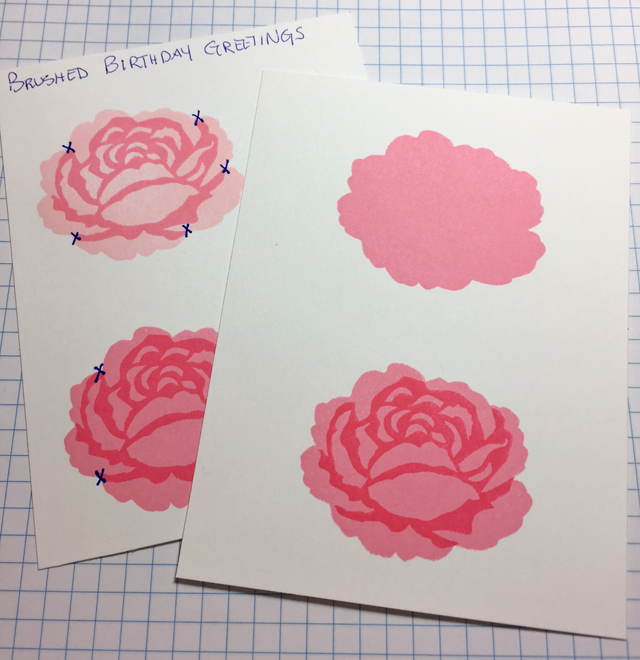 I started by stamping balloons in four shades of pink,then I added a few rose pink balloons similar to the inspiration photo. 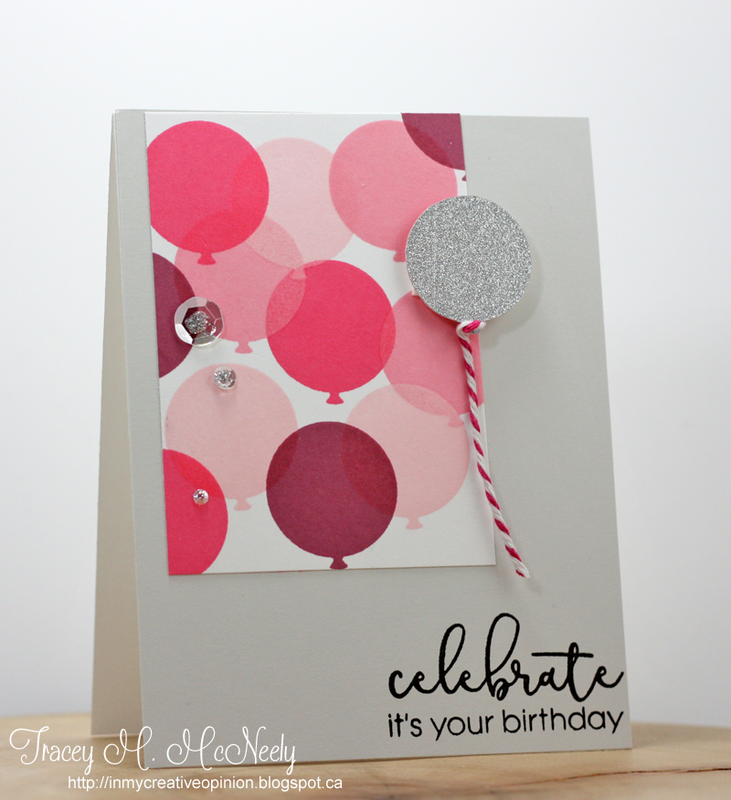 One balloon was die cut with silver shimmer paper. 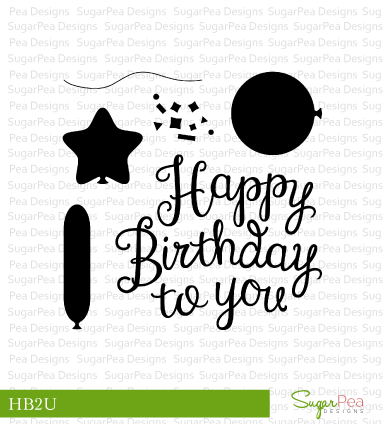 The scene was created on a soft grey card base which the sentiment was stamped in the bottom right corner. The balloon panel was cut down to size and adhered directly to the base and then the silver balloon was added with some foam tape for dimension. Pink twine was wrapped around the balloon as the string. 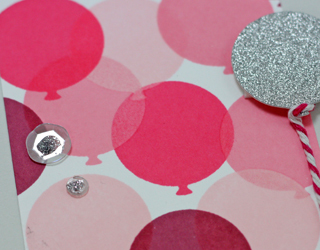 a few Stickles filled sequins were added to the balloon panel.